Protect exposed pipes from cold air drafts by closing and sealing windows and any exposed openings in basements or crawlspaces. Provide proper insulation for walls and pipes where necessary. If pipes cannot be shielded from the cold or the residence has a history of freeze-ups, run a small stream in an inside faucet to keep the water moving through the pipes when temperatures reach the single digits. Make sure the drain is not plugged or blocked. Keep your thermostat set above 55 degrees F, even if you will be away for several days. Be sure you and other household members know where your main shut-off valve is located in case an emergency occurs. 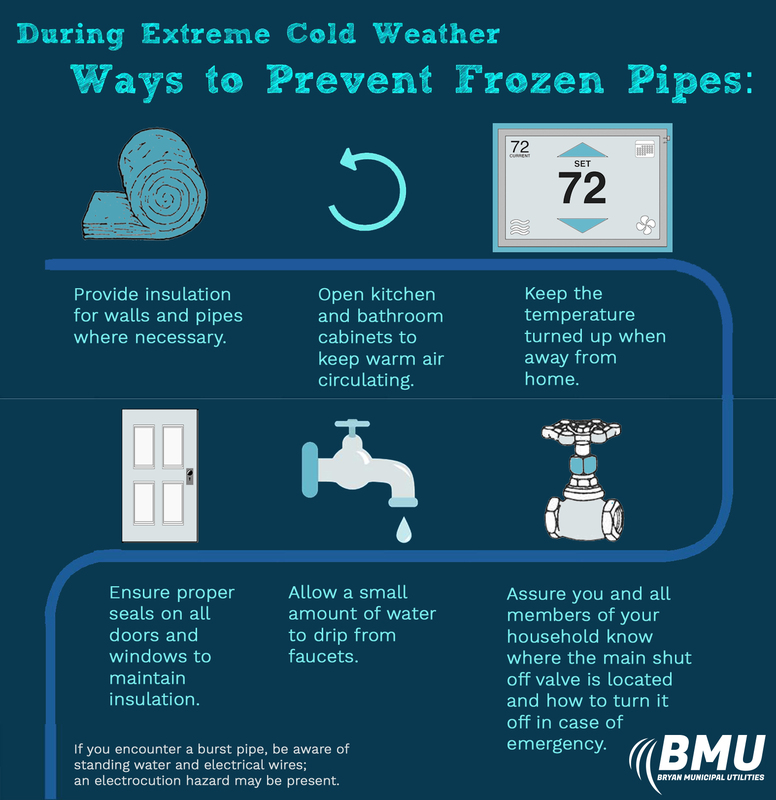 If your pipes freeze despite these precautions, do not try to thaw them with a torch. If you encounter a burst pipe, be aware of standing water and electrical wires; an electrocution hazard may be present. Call a licensed plumber or the Bryan Water Department, 419-633-6100 if you are not sure what to do. The Bryan Water Department cannot work on private service lines or plumbing, but water personnel can confirm that the service line to your property is thawed.